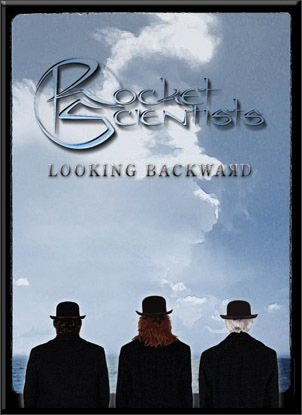 Looking Backward is a 4 CD/1 DVD set that chronicles the recorded history of Rocket Scientists since their 1993 debut. In addition to their first three studio releases (the 1998 live album Earth Below and Sky Above isn’t included), the fourth CD contains new recordings of material from the first two albums Earthbound and Brutal Architecture, alternate recordings, and remixes. The DVD contains studio footage of the 2007 recordings, interview segments with the band, a 25-minute mini-documentary with Emmett Chapman (inventor of the Chapman Stick, which bassist Don Schiff uses extensively), and another 20 minutes of studio footage from the band’s entire history. Whew! But that’s not all! The package also includes a 64-page color booklet (does anything that big qualify as a ‘-let’?) with lyrics, pictures, and extensive liner notes. It’s a comprehensive package, to say the least. All of which wouldn’t amount to a hill of beans without the music on the discs, and the quality of this set more than measures up to the quantity. Although the name Rocket Scientists might give the impression of a group of lab rats creating overly technical music, they are first and foremost a song-oriented group. This is most evident on disc 4, Earthbound, from 1993 (the discs are numbered in reverse chronological order, hence the name Looking Backward). As the band explains on the DVD, many of the recordings on this album were originally intended as demos that they fleshed out into the versions that were eventually released. The arrangements are rather conservative; focusing attention on the songwriting and featuring some nice playing, but never fully breaking out into ‘prog’ territory (all of the songs clock in at under five minutes, which is about the length of the average prog guitar solo). 1995’s Brutal Architecture shows the band starting to embrace more of an experimental sound, adding varied instrumentation (such as the aforementioned Chapman Stick, which was used exclusively for the recording) and much more complex arrangements to the acoustic guitar foundation of vocalist Mark McCrite. Parts of the album have a looser, almost jazzy improv feel. The album is a bit schizophrenic at times, as though the group is still trying to strike the right balance between ‘pop’ and ‘prog’. The strong songwriting focus is still very much in evidence, however. 1999’s Oblivion Days is a much heavier (and lyrically darker) album, with the band showing tons of confidence and playing like a well-oiled machine. The roar of “Aqua Vitae” is truly impressive. Overall, Oblivion Days is a great leap forward in the band’s ability to add adventurous arranging, production, & playing to the solid songwriting established over the two previous albums. Keyboardist Erik Norlander generates a huge orchestral sound throughout the album, and showcases his arranging talents on the track “Space 1999”. There is less of the singer/songwriter approach than on the previous albums, but more of a ‘band’ feel, perhaps the result of them working as a live unit regularly before the recordings. The 2007 Sessions CD features new recordings of much of the material from Earthbound and a few tracks from Brutal Architecture, expanded upon and extended. In addition to benefiting from the obvious upgrade in recording technology, the new recordings show the group working together to reinterpret material that was originally written over fifteen years prior. “Earthbound” in particular is given a terrific new treatment, and “Pythagoras” is stretched from what was originally a 57 second instrumental break to a four-minute workout for the entire group. The Looking Backward DVD is a lighthearted affair, with the group discussing various aspects of the band’s history and the background of the various tracks, interspersed with in-studio performances of the 2007 recording sessions. The History of Rocket Scientists segment is mostly home movies of the band at work in the studio. Most enjoyable for me is watching bass maestro Don Schiff at work adding his unique contributions on standard & fretless bass, bowed guitar, stick, and his custom NS/Stick hybrid. Looking Backward is a terrific package. Where many progressive bands stopped actually progressing years ago, Rockets Scientists have over the years shown considerable progress and growth. In addition to their obvious instrumental prowess, there is also cohesiveness to their songwriting that makes it easy to play all four CDs back to back. There aren’t many packages of this size you can say that about!